After adverse weather conditions put paid to Felix Baumgartner's first attempt at jumping from the edge of space on Tuesday, the Austrian daredevil will get another chance to make history on Sunday. On Tuesday, Felix Baumgartner had just climbed into his space capsule and was moments away from lifting off on his journey to the edge of space when a strong 40kmph gust of wind near the top of his 230m-high helium-filled balloon forced the Red Bull Stratos team to abort their mission to make the world's highest skydive from 36,600m. There was very little wind at ground level when the Austrian adventurer strapped himself into the capsule, but gusts of wind higher up, around the top of the 850,000-cubic-metre balloon, made it impossible to continue. 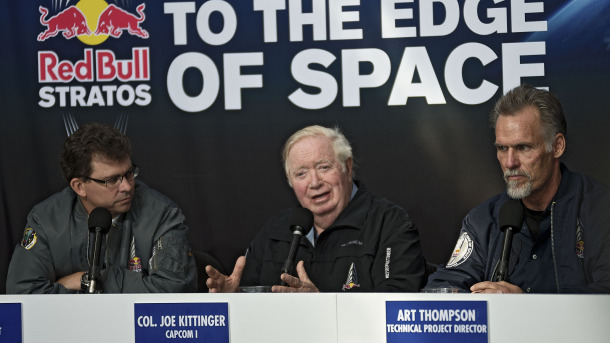 "As we inflated the balloon and got Felix into the capsule at about 11:42am, we experienced a gust of wind that took us above 40kmph at the peak of the balloon," said Red Bull Stratos Project Director, Art Thompson. He went on to add that the gust had twisted the balloon in a way that could have damaged the delicate polyethylene material. "The integrity of the balloon at that point is really unknown and it's unacceptable to use it for manned flight because we're not sure what will happen as we launch. Our biggest problem was the wind at the 230m level." According to team experts, for a successful launch the wind speed shouldn't exceed 5kmph or there's a chance that the envelope could tear when the support team release it. "We knew we only had a small window of opportunity today, which we finally didn't hit," added Thompson. Felix has been training for five years for a mission that, as well as breaking four world records, will help to improve scientific understanding of the stratosphere and how the human body copes with such extreme conditions. 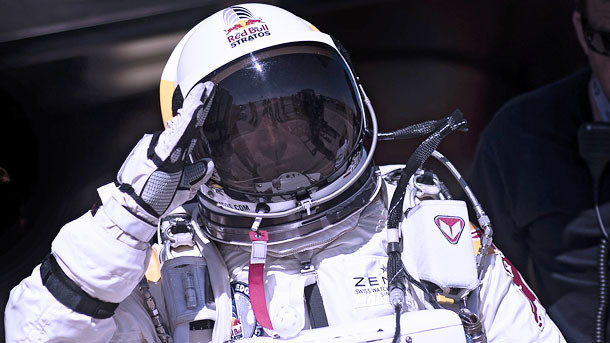 The 43-year-old extreme athlete said he was surprised by the decision to abort the flight on Tuesday but he's optimistic that he'll still get his chance to break the 52-year-old record set by US Air Force Colonel Joe Kittinger, who is working as an adviser on the project. "When Art told me we were aborting the mission I thought it was a joke," said Felix. "I thought, there's no way that the conditions are not right. I couldn't tell what was happening with the balloon because I was in the capsule. I want this to happen this year. We've made it so far. There's no turning back. We're here, we've got the helium and we're good to go. Whether that's tomorrow or the first day next week, I don't really care." At a news conference on Wednesday morning, pictured above, Red Bull Stratos meteorologist Don Day presented a new weather forecast and it appears that the next window of opportunity for Felix will open on Sunday 14 October and remain open until the end of play on Monday. Keep checking redbullstratos.com for upates.